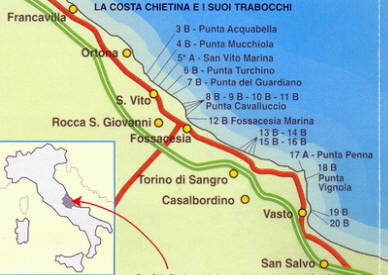 The Trabocchi Coast also known as the Teatina Coast. Of the many unique, wonderful things to see on the Abruzzo coast, are the famous and picturesque "fishing machines", called trabocchi. These are basically fishing huts built entirely of wood and arranged on platforms (from where the fishermen cast their nets into the sea) supported by stilts; there is a long, hazardous walkway, also set on stilts, which connects the shore to the hut and which may be many metres in length. The best time to admire these spectacular fishing devices is on a stormy day, when their astonishing ability to resist rough seas is most evident, despite their fragile, unstable appearance. The origins of the trabocchi are uncertain and it is not easy to establish exactly when they were invented. We might imagine they were built so that fish could be caught without going out to sea, since it is easier to fish from a standing position on a walkway connected to dry land. There is a unique historical note regarding that concept: the first document to speak of the Abruzzo trabocchi dates back to 1400 and is signed by father Stefano Tiraboschi, a Celestine monk. In his "Vita Sanctissimi Petri Celestini", the monk described the time that Pietro da Morrone spent in the monastery of San Giovanni in Venere, in Fossacesia – almost three years, from 1240 to 1243 – and states that the saint climbed the hills to admire the sea "dotted with trabocchi". From this it can be inferred that in 1240 (or at least at the time the biography was drafted) these fishing machines were already widely used. The video below gives you a glimpse of what is available along the coast and inland. In Abruzzo you will find that there is a tourism for all tastes, both mountain and sea lovers. 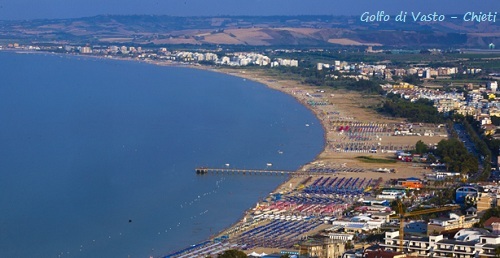 The Beaches : Hidden among the high cliffs and bluffs is the small gulf of Venere and Vasto with its wide and sandy beaches stretching as far as Molise. In this area the cost is characterized by typical fishing marinas, where fishing boats loaded with fish come to sell their catch to the many local family restaurants. With numerous events and festivals one can also taste typical local dishes and wines with excellent and vast culinary choices. Torino di Sangro Marina confirms the distinctive features of this stretch of Chieti coast, which offers the chance to enjoy a holiday in close contact with nature at its best.The resort is to be found south of the mouth of the Sangro, and just nine kilometres inland we will find Torino di Sangro. Vasto is the last of Abruzzo's great coastal towns: it is actually located at the far south of the Abruzzo coast.The old centre clings to a hill that dominates the gulf, boasting a millenary history as it was founded in the Italic period and was later conquered by the Romans.Vasto has a large number of accommodation facilities, various agritourism farms, several B&Bs, campsites and about 30 private lidos. the town also offers the fun alternative of huge aqua park with its slides, pools, games, as well as evening and night events. Before reaching the mouth of the river Sangro, we find Fossacesia Marina, a small fishing village that nonetheless has some interesting amenities. Most of the tourist facilities are south of the rocky shore of Punta Cavalluccio. The town of Fossacesia is nestled in the so called Venus's hill surrounded by rows of olive trees. The beach is part of Fossacesia Marina area of the Costa dei Trabocchi. Consists of big pebbles alternating with splendid bays of clear and fine sand. Francavilla al Mare is one of the most famous seaside resorts of the coast. Popular tourist destination for families. Much sought after for its sandy clean and quiet beach. Not far from the mouth of the river Sinello we encounter a quiet resort called Lido di Casalbordino,which offers the tourist a fine sandy beach, several hotels, a campsite and three private lidos. It is also a good starting point for those who want to attempt a good excursion along the coast, to reach the spectacular rocky coast of the Punta Aderci Nature Reserve. The town of Ortona is a lovely tranquil little city with breathtaking views of the Adriatic. it is famous most of all for its history. Despite the town centre being heavily damaged during the second world war (a terrible battle was fought through its streets and Churchill defined it "the Stalingrad of Italy") it is nonetheless worth visiting for its cathedral (SanTommaso), the Aragonese castle and the churches of Santa Maria delle Grazie and SantissimaTrinita' . A day visit is enough time to wander around the small streets, a quick stop at one of the local bakers to grab a piece of freshly made pizza and inhaling the relaxed atmosphere in the air. The charming beach is pebbly and shaded by handsome sandstone cliffs. 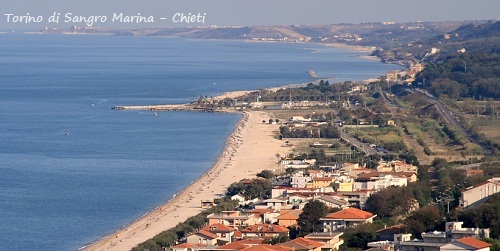 The marina is dominated by the lovely old centre of SanVito Chietino, set above the Adriatic; this seaside resort is a lovely, quiet locality on the Chieti coast, between Ortona and the Punta del Cavalluccio point. This quiet seaside town has a fine sandy shore with about 20 private lidos and offers niche accommodation that relies on several hotels and campsites, as well as the usual holiday rental homes, B&Bs and agritourism farms further inland. 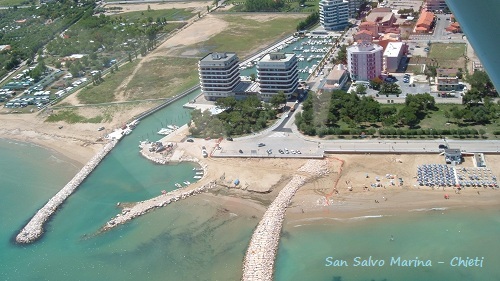 Geographically the last town in the region, but definitely not in importance: San Salvo Marina lies right on the Molise border, in view of the mouth of the river Trigno. Protected Areas : This part of the coast is more private and romantic, full of quiet spaces, isolated coves, beaches protected by cliffs and a special fishing villages atmosphere. The cliffs and small coves with sandy beaches and bays alternate with pebbly beaches, where crystal clear waters allow you to discover and observe the beautiful and rich marine life. In the background one can see the impressive outlines of the mountains. Punta Cavalluccio gulf rolls down to the mouth of the Sangro and is dominated by the lovely Cistercian abbey of San Giovanni in Venere, which overlooks the sea in a truly enviable position. The Punta di Ferruccio is a promontory in the municipality of Ortona. The pebble beach stretches between two peaks of the tuff rocks that plunge into the sea, rich waters whose color assume the typical emerald green of the Adriatic, unfortunatly, one of Abruzzo's most beautiful beach is in a state of neglect by local authorities. 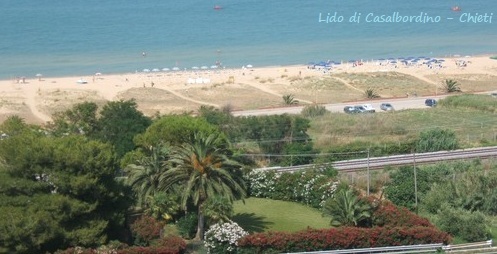 The beach of Punta dell’Acquabella is located in the Regional Nature Reserve Punta dell’Acquabella in Ortona. 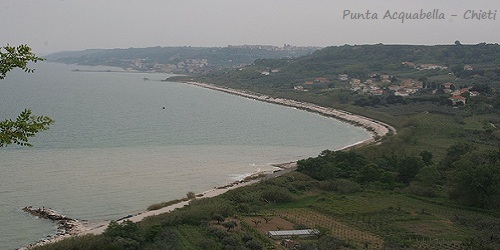 Punta d'Erce or Punta Aderci is a suggestive Regional Nature Reserve established in 1998 and located in the town of Vasto. This part of the coast of Abruzzo is characterized by rock cliffs overlooking the sea. There are numerous species of marine life and the many bird species that nest in the reserve. 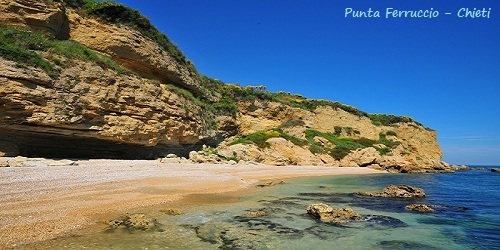 The Beach of Punta Penna is located near the town of Vasto and is one of the Abruzzo's wild and free few beaches still remainning.It is a beautiful beach of soft golden sand featuring magnificent dune formations which, together with those of the beach in Vasto Marina, are one of the best preserved natural habitats of the coast.